This is easy to make and is delicious eaten hot or cold. 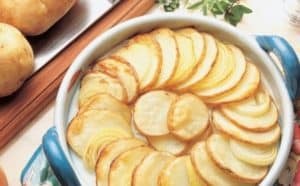 Layer potato slices and onion rings into an 8 cup capacity ovenproof dish. Add milk and sprinkle generously with pepper. Dot with margarine and sprinkle with cheese. Bake in preheated oven for 40-45 minutes or until tender and the top golden brown and crisp.